Decolonised nations became a key arena for Sino-Soviet rivalry: a mass of new countries in search of blueprints for state-building and in which Russia and China could promise to build brave new socialist worlds in their own image. Why Hong Kong’s district council elections are important now? 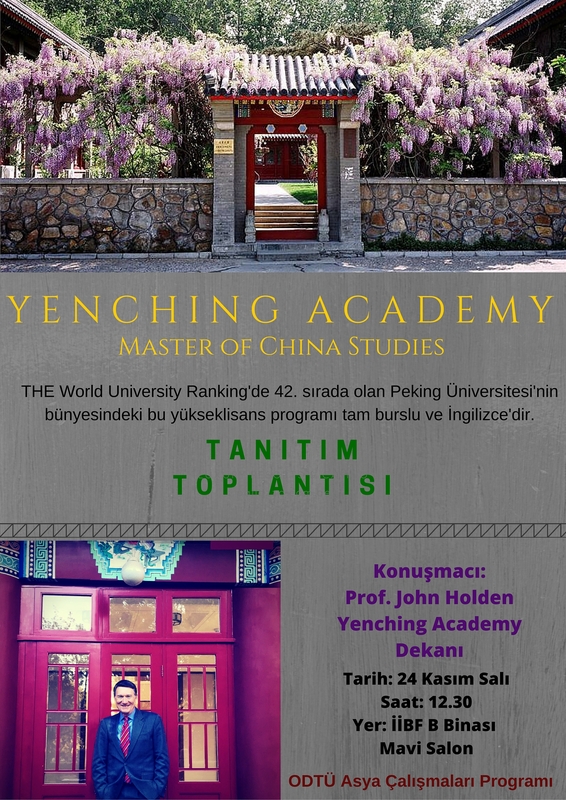 Yenching Academy China Studies Master Program (yenchingacademy.org), Times Higher Education World Universities Ranking’de 42. sirada olan Pekin Universitesi’nin uluslararasi ogrenciler icin actigi, tam burslu, egitim dili Ingilizce olan bir yukseklisans programidir. Sectikleri kariyerlerinde ilerlerken Cin hakkinda bilgi sahibi olmak ve ileride baglantilarini korumak isteyen tum ogrencilerimizi ilgilendirebilecek bu yukseklisans programini tanitmak uzere Yenching Academy Dekani Prof. John Holden 24 Kasim Sali gunu universitemizi ziyaret edecektir. Tum ilgilenenleri Yenching Academy tanitim toplantisina bekliyoruz. Etkinligin afisini ekte bulabilirsiniz. The METU Conference on International Relations, one of the oldest annual conferences in Turkey on international relations, will be held between 25-27 June 2014, marking its 13th year. This year’s conference will occasion the 30th anniversary of the establishment of the Department of International Relations at METU. The Conference takes pride in annually bringing together scholars from all around the world to exchange views. The confirmed speakers for this year’s conference include Emeritus Professor Barry Buzan (London School of Economics and Political Science), Professor Andrew Linklater (Woodrow Wilson Chair, Aberystwyth University), Professor Ali Karaosmanoğlu (Center for Foreign Policy and Peace Research, Ankara) and Professor Yongjin Zhang (University of Bristol). The conference aims at showcasing innovative research from across the social sciences, humanities and related disciplines, on themes of particular relevance to Asia, reconceptualized as a dynamic and interconnected historical, geographical, and cultural formation stretching from the Middle East through Eurasia, South Asia, to Southeast Asia and East Asia.